Clarke acknowledge Smith made a horrible mistake. 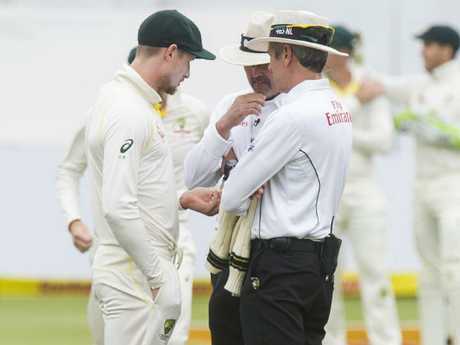 THE fallout continues to the ball-tampering scandal that has rocked Australian cricket and threatens Steve Smith's future as captain. Former skippers Allan Border and Michael Clarke are among a host of dismayed former greats who are in disbelief about the low Smith and the Australian team stooped to in an attempt to find a way back into the third Test in South Africa. Cricket Australia CEO James Sutherland is scheduled to address the controversy at a press conference today. An emotional Clarke was visibly upset as he spoke about the "disgraceful, premeditated" cheating on Channel Nine's Sports Sunday program and was confronted with questions about whether he would consider returning to skipper the national team three years after his retirement. "If I was asked by the right people, then I would think about my answer," Clarke said. 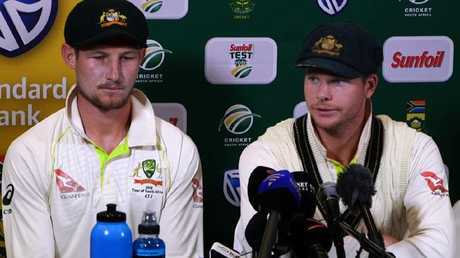 Steve Smith and Cameron Bancroft face the media after the ball tampering incident. Clarke was pressed several times to give a committal answer but while he didn't completely rule out a return, the 36-year-old looked pained by the fact he may even need to consider such a scenario. Clarke also blasted the thought process that went through the Australians' heads whereby they thought they needed to cheat to win a game of cricket. He said it was stupid and nobody thought about what they were doing. 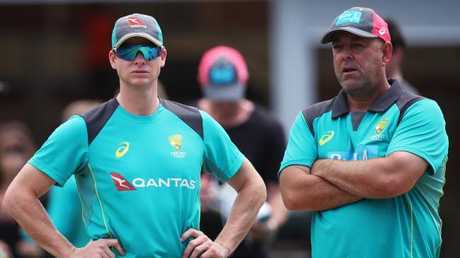 Ex-Aussie opener Simon Katich said there's no way Smith, vice-captain David Warner and coach Darren Lehmann can keep their jobs. "I guess from my point of view I think when Cricket Australia front the media, they've got no option but to stand and then sack Smith, Warner and Lehmann," Katich said. A dark day in Australian cricket. "They've got no option because this was premeditated and calculated at the break and those guys are in charge of Cameron Bancroft behaving the way he did. "It's a bigger problem than that, he's been instructed to do this and anyone in cricket knows the captain and coach are responsible for what happens in the team." Former Test star Adam Voges had a different take, backing Smith to retain the captaincy. "Personally, I agree with him, he is the right man for the job albeit he has made a mistake," Voges said. "I think there's so many good things he does do that this is one very poor lack of judgment on his behalf and on the team's behalf. Broadcast footage captured Cameron Bancroft attempting to hide the sticking plaster he is alleged to have used to tamper with the ball. "But going forward in my opinion he's still the right man for the job." However, Voges also said Smith and Bancroft would need to work hard to regain the respect of the cricket community. "This has tarnished both their reputations and they're going to have to work hard to win back the respect of not only the cricketing world, but the general public as well," Voges said. "It's something that (Bancroft) will have to live with as a player, his name will be tarnished. 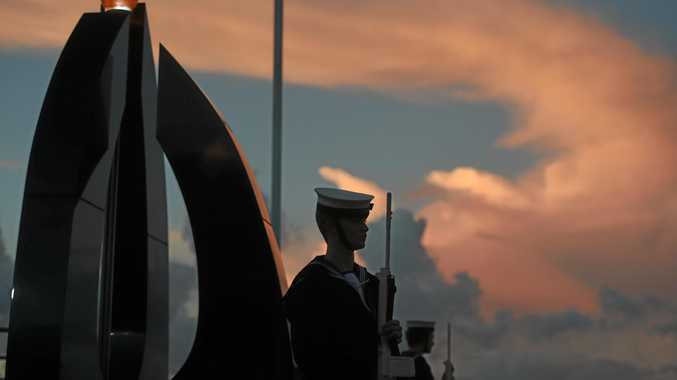 "As will Steve Smith's given the whole leadership group was aware of the plan. "There's genuine remorse about this decision, it's a really poor mistake on their behalf and something they'll both have to live with, as will the reputation of the Australian cricket team." 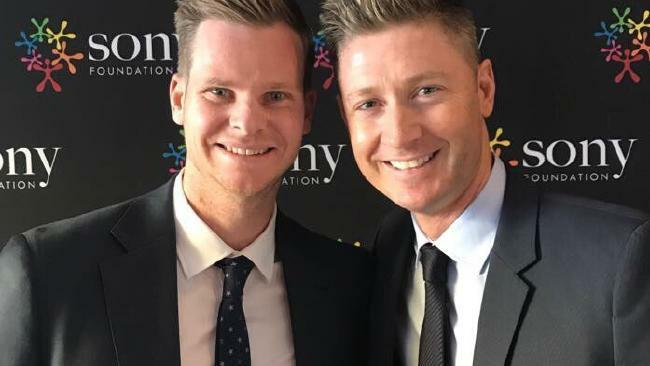 Smith said the coaching staff wasn't aware of the plan to cheat but News Corp cricket journalist Robert Craddock said if that wasn't the case, then heads should roll. Steve Smith and coach Darren Lehmann. "I'm very interested in the coaches in this one, I want to know what Darren Lehmann knew about this and (bowling coach) David Saker, did they know nothing about this? Are you serious?" Craddock said. "There are two things I believe about this, if they did know something about it, they should be sacked, if they didn't, then what do they actually do? "They're hatching all these bowling plans, what, did they never consult them? "I'm telling you, Darren Lehmann, and Saker, is really in the gun on this." Former Australian ODI star Jimmy Maher said the incident marked "a day of national shame".